Jo Jos is a huge restaurant located upstairs in the mall – its large, wrap-around balcony can be seen easily from the intersection between both streets of the mall. It is extremely popular around meal times, and it was hard to find a table to seat six people at 1pm on a Friday. Jo Jos consists of multiple kitchens, all of different cuisines, and each meal must be ordered at its appropriate kitchen – which is inconvenient if your guests are wanting a different cuisine to your own. Overall, the menu was very pricey. I ordered a pizza, the portion sizes of which is misled by the images on the menu, which show it as a scaled-down pizza. Instead, you get a full sized, huge pizza that can easily feed 3 people. I only ate 2 of my 8 slices, but it sure tasted great! Others at my table shared fish and chips ($22) between two people easily. Pricey, huge portions, confusing layout but great-tasting food. Prepare to share with someone else! 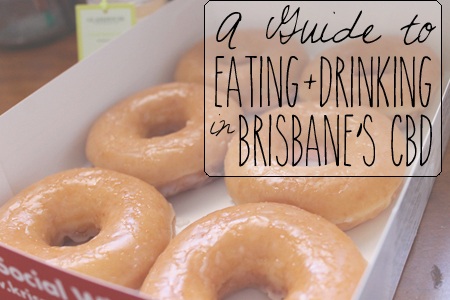 There are no Krispy Kreme stores in central and north QLD, so it is a necessity to eat as many Krispy Kremes as possible when in a city that sells them. It is one of the only places where I am 100% satisfied to eat the “plainest” item on the menu. I had 3 original glazed donuts whilst in Brisbane and picked up another half dozen before my flight home from the conveniently-located airport store. Their Apple Custard Crumble was not disappointing – it was fresh, with an abundance of “crumble” on top with a delicious apple-flavoured custard inside the donut. Ah-mazing. Chopsticks add an element of fun, great prices, great quality food. Wouldn’t recommend ordering rice! I was excited to try the well-hyped Christmas drinks menu at Starbucks, so it was a tough decision which drink to get on my only Starbucks visit for my trip to Brisbane. The Christmas Cookie Latte tasted very strongly of coffee (surprise surprise) so as a non-strong-coffee drinker, it was tough for me to taste the Christmas Cookie part of the latte. However, as I got down to the cream, drizzle and cookie crumbles, I could finally taste the flavouring. Personally, it didn’t stand out as much as I would have liked, and I would have liked to try their Peppermint drink. Good for those who like strong coffee, not so much for sweet-drink lovers. You can always rely on Nando’s for a cheap, easy meal. 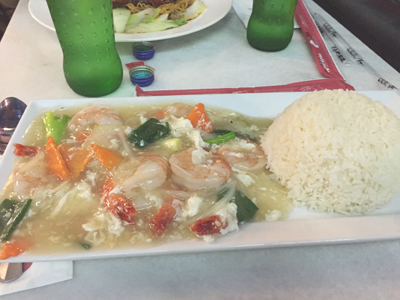 They offer both dine-in and takeaway options in a variety of sauces, depending on your tolerance for spicy foods – Lemon and Herb is one of their milder options, and is perfect for my tastes. They also offer chips with Peri-Peri seasoning if desired, which can be a bit spicier but more interesting than plain old regular chips. I find that 1/4 of a chicken is enough to fill me up, but 1/2 of a chicken isn’t too much either. Although I ate at Kelvin Grove Nando’s, there are stores at South Bank, underneath Oaks Festival Towers and in the Myer Centre in Queen Street Mall, although the latter closes very early so it is not ideal for dinner. Cheap, delicious and plenty of options available to suit individual tastes. Dine in or takeaway and plenty of CBD locations. Lefty’s is an old burlesque joint converted into a bar, which even when we visited on a Sunday night, was pretty busy! We spent the entire time in a secret bar behind an emergency exit door, by a friend’s recommendation. Lefty’s had a good atmosphere and a great nautical theme, however the bartenders were unhelpful (and seemed to be on all kinds of drugs). This bar also serves a beer called Stone and Wood – a passionfruit-tasting beer which the boys all loved. The best thing about it was that we could walk back to the hotel afterwards! Good atmosphere, not a large drink variety, alright setup but I’m not personally a bar person. Nitrogenie is an ingenious idea for an ice cream shop, where they use liquid nitrogen to make the ice cream. The flavours they offered all sounded amazing, and although a little pricey for what you get, isn’t much more expensive than a standard ice cream shop. The liquid nitrogen did not offer a noticeable taste difference, so it is more of a novelty than a new taste experience. The staff here were lovely, and the meals were great quality – my butter chicken tasted amazing! For the prices of the naan and rice, they were a great size to share between two. I couldn’t get through my meal or my share of naan. I ordered by dish mild, but spicier options were available if desired. There was absolutely no spicy aftertaste to my dish whatsoever, which is great for anyone who can’t tolerate spice like me. Tasted amazing, great portions, but was a little bit pricey. As expected, the meals here were amazing and very chocolatey! The churros were the first proper churros I have eaten and they were crisp, warm and tasted amazing in the milk chocolate dipping sauce. I’m more of a dark chocolate person than a milk chocolate person, but the churros, in my opinion, tasted much better in the sweeter milk chocolate dip than the bitter dark chocolate dip. Next time I will have to try the white chocolate to get a proper idea of which dip goes best! The three churros each were more than enough, and the drinks tasted amazing! I love the option of getting takeaway cups for the drinks, especially since we’d only just finished a huge dinner. Great tasting, amazing food and drink, friendly staff. Slightly overpriced drinks. I’ve never been to a bowling alley that served decent food and drink before, so Strike Bowling was a great place to eat and have a fun game of ten pin bowling! Between four people, the 2 pizzas and 2 bowls of wedges distributed well. The sweet potato wedges were amazing and were served with a garlic aioli, I think most of my meal consisted of these wedges. The regular wedges had a great spice to them and came with tomato sauce and sour cream, and the pizzas were pretty good quality! There is also a bar at Strike, but the cheap lunch time deal only offered soft drink. Cheap, great quality, great variety, great venue. Vapiano is a very popular, unique restaurant right in the heart of the CBD, next to Little Singapore. Choice of seating is free, which usually means that small groups take up large tables and leave no seats for other customers, but we managed to find a table for two. The way ordering works is that you receive a prepaid card on entry, go up to the kitchen and tell the chef what you would like, tap the card and watch the chef make the entire dish in front of you. During cooking, the chef starts a conversation with you and even customizes the dish to your liking based on what you would like. The chef I had was very friendly and asked all about what I studied at university and promptly apologized if he needed to wait for anything during the cooking process. Overall, cooking was quick and very refreshing to hold a conversation with the chef cooking your food. Portion sizes were great, too! Unique experience, great quality food, great portion sizes, affordable prices – a restaurant experience I would recommend to anyone! d taste the caramel. The smallest sized drink was still of a reasonable size, but didn’t last long in the hot weather. It was refreshing and definitely woke me up, and the sweetness throughout the drink was fantastic especially when I reached the end, and could combine the cream, caramel sauce and biscuit bits into one last delicious drink. The quality of Zarraffa’s Coffee definitely seemed greater than Starbucks coffee. Delicious, perfect balance of sweetness and coffee, but slightly overpriced and required a bit of waiting to order. Do you know any more CBD restaurants I should try next time I’m in Brisbane? Let me know in the comments!